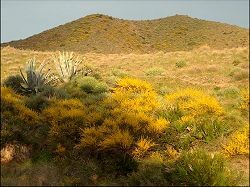 The Cabo de Gata Natural Park lies in the middle of the Costa de Almeria, east of the city of Almeria and extends to 38,000 Ha of land and 12,000 of sea, along a 30Km stretch of coastline. 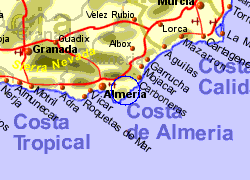 This area is unique due to being one of the few volcanic rock formation in the Iberian peninsula, a fact which results in some very clear seawater. 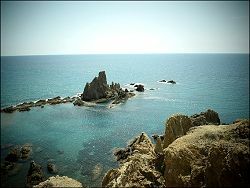 The semi desert hills behind the coast are not high (at less than 500m) but results in a number of attractive coves and beaches (some of which can only be accessed on foot or by boat), and some of the clearest water on the Spanish Mediterranean coast, ideal for snorkelling. The reason for including 12,000 Ha of sea in the Natural Park is to protect the sea life against fishing. Towards the western end of the Natural Park are the salt flats known as Almadraba de Monteleva which attract a large number of bird species, including pink flamingos. 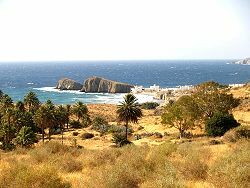 Almost on the southern most tip is San Jose, a small town with a curved beach of golden sand that slopes very gently into the sea. 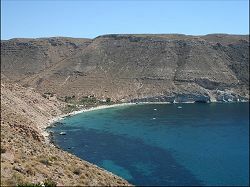 Nearby heading west are found the excellent sandy beaches of Monsul and Genoveses. 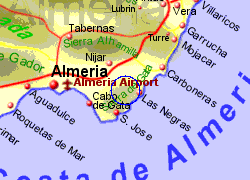 Heading north east there are a number of beaches before coming to the village of Las Negras with its small collection of fishing boats pulled up on the sandy beach and Agua Amarga, slightly larger with a number of pleasure boats at one end of its beach. Both these last two places have 2 or 3 bar/restuarants overlooking the beach. The last beach of note before getting to Carboneras is Playa de los Muertos, which appears in many local postcards, requiring a walk of a Km or 2, is very fine pebbles rather than sand and slopes fairly steeply into the water which is very clear. This beach is popular with local people. 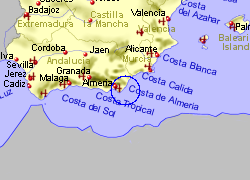 Map of the Cabo de Gata area.